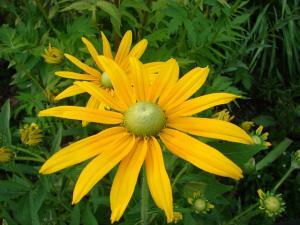 Rudbeckias are cheery native flowers that are indispensable in the perennial border. Their golden daisy-like flowers and long blooming period has made them a favorite of gardeners. 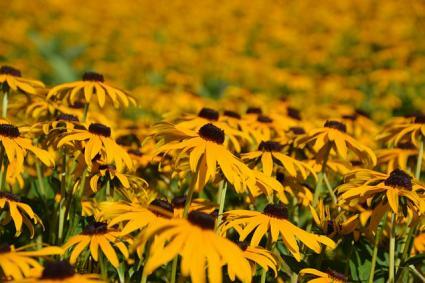 There are 25 species in the genus Rudbeckia, all native to North America. They come in both perennial and annual forms, but the various species and cultivars all share common physical attributes and growing requirements. The flowers are two to four inches in diameter and generally have yellow petals, though various shades of orange, red and brown can also be seen. The center of the flower is usually dark-colored - this is the 'eye' of black-eyed Susans, one of their many common names. The flowers rise on two to three foot stems starting in early summer though there are a few dwarf varieties available. The foliage is dark green and concentrated at the base of the plant in a tidy clump about six to eight inches tall. Individual leaves are spade-shaped and two to four inches long. Rudbeckias are among the best species for perennial flower borders and wildflower meadow plantings, where they are often planted in large swaths. The shorter forms do well in planters. They are often used in native prairie restorations and butterfly gardens, where they are an important source of nectar for bees and butterflies and of seed for birds. 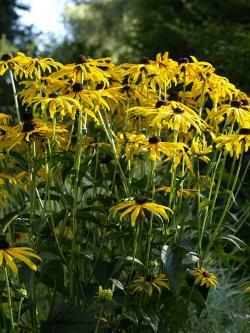 Their long, strong stems make Rudbeckias a good flower for cutting, whether for fresh or dried arrangements. Rudbeckias grow best in full sun, but will tolerate partial shade. Regular moisture keeps them lush and vibrant, but they are moderately drought tolerant once established. They accept a full range of soil types as long as drainage is good. They're not a good choice for the least fertile soils though they do not demand heaps of compost and fertilizer. In fact, they flower most profusely in soils of modest fertility. Other than providing occasional irrigation and removing the flower stalks as the blossoms fade, there is little maintenance involved in growing Rudbeckias. They bloom from summer into fall, and deadheading will prolong the bloom period. At the end of the growing season the entire plant can be cut to the ground. Every few years, the expanding clumps can be divided in fall. Most pests and disease that attack Rudbeckia are minor annoyances that can be tolerated in the context of a perennial border or meadow planting. One to watch out for, however, is a pathogen called aster yellows. 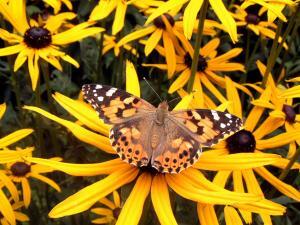 This disease is lethal and effects many species in the aster family, of which Rudbeckias are a part. Infections show up as stunted plants with deformed leaves and flowers that quickly turn yellow and die. There is no cure for the disease, but it is important to remove and dispose of any plants that become infected with it. Do this is as soon as symptoms appear to stem the spread of the disease. There are two Rudbeckia species commonly grown along with an impressive assortment of cultivars, all of which are commonly available in nurseries. Also known as black-eyed Susans or gloriosa daisies, this is the most common type of Rudbeckia found in North American gardens. They are short-lived perennials, but often reseed themselves in the garden. Hardy in USDA zones 5 to 10 though it can be grown as an annual elsewhere. 'Indian Summer' has layers of deeply saturated orange, red and brown stripes on the petals resembling a fiery sunset. 'Toto' is a dwarf form that grows only 12 inches tall. 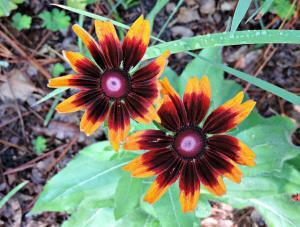 This species is also known as black-eyed Susan or as orange coneflower. It is difficult to differentiate from the R. hirta. It is hardy in USDA zones 3 to 9. 'Goldsturm' is the most common cultivar and has pale yellow flowers. 'Viette's Little Suzie' is a dwarf version of 'Goldsturm'. 'Green Eyes' has a green center instead of the usual brown. Rudbeckias are the quintessential perennial - low maintenance, adaptable, and bearing flowers that are easy to enjoy indoors and out. Their bright yellow blossoms come again and again and are synonymous with the summer sun.